Gotta hand it to ’em: Those Wall Street guys are smart. They’ve already found two ways to plunder the nation’s wealth for their own enrichment, and now they’re working on a third. The first way? Identify and finance a wave of Democratic politicians who would join with Republicans in deregulating Wall Street. The second? Employ the same so-called ‘centrist’ Democrats, along with their Republican cohorts, to bail them out after they crashed the economy. That bailout continues, and the assurance of protection from being prosecuted for their criminal misdeeds. Now comes Wall Street’s “third way” of hijacking the nation’s wealth: it’s trying to persuade Democratic supporters to support the dismantling of the social contract that has held our society together for 75 years. And it’s using many of the same tactics — and many of the same faces — it used in its first two forays. If you liked Wall Street deregulation, an inequitable bank bailout, and a get-out-of-jail-free card for bank executives, you’re going to love this. 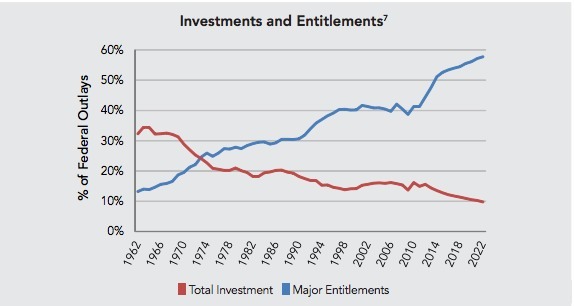 The goal is to cut the popular and successful programs they describe as “entitlements.” Cutting Social Security benefits will reduce political pressure on the undertaxed wealthy, while creating new investment markets for Wall Street reitirement funds. Directly or indirectly slashing Medicare and Medicaid benefits also reduces that pressure. It would be more effective, more humane, and more rational to reduce Medicare’s costs by reducing the effects runaway greed at every level of our health economy – but that would be bad for their investments. For decades this effort has been heavily funded by Nixon Cabinet member turned hedge fund billionaire Pete Peterson, along with a number of other wealthy individuals and corporations. And they’ve never lacked for advocates in both parties, politicians who are eager for the attention and plaudits they’ll receive while in office and the cozy sinecures as “committee chairs,” “advisors,” and board members they’ll enjoy after retirement. Let’s call this effort what it is: a billionaire- and corporate-funded “anti-social contract movement.” And let’s recognize it for what it is: the third wave in a movement to capture an ever-increasing share of our nation’s wealth for a tiny group of people. Ari Rabin-Havt’s invaluable radio show on SiriusXM Left, The Agenda, provided the platform for this debate. Kessler’s to be commended, I suppose, for engaging in any debate at all. Other leading figures in his movement, including media mavens Alan Simpson and Erskine Bowles, scrupulously avoid any in-depth discussion of their positions with knowledgeable people of different viewpoints – undoubtedly because of the weakness of their arguments. Third Way’s latest assignment is to present itself as a “progressive” group which believes, however regretfully, that we must to cut Social Security and Medicare benefits. You know how that goes: “This hurts me more than it hurts you” and all that. But it’s difficult to pretend you’re “progressive” or “on the left” when your own website drips with disdain the left. So when Third Way employees describe themselves as “progressive,” they should be asked which aspect of that movement they’re embracing: Is it the “rigidity,” the “outdated orthodoxies,” or the “false choices”? Nevertheless, credulous journalists in the mainstream media are buying the idea that “the left is divided over Social Security and Medicare,” using Third Way as the sole example of the split. And Kessler dutifully describes himself as progressive in his debate with Lawson. Third Way’s rhetoric is straight out of the Pete Peterson, anti-social contract playbook. Like other members of that movement, they disparage people of differing viewpoints (cf. “stale,” “rigid,” and “orthodox”) and describe themselves in grandiose terms, as when Third Way promises “Fresh Thinking” to replace the stale ideas of their opponents. But there’s nothing “fresh” about an agenda that promises more of the same economic policies that have decimated the middle class for three decades. Silence? It’s a billionaire-funded cacaphony out there. It’s so loud that the truly knowledgeable experts on the topic can’t be heard above the din. My only face-to-face encounter with Third Way took place during an all-day seminar wheld at their Washington DC offices in 2008. But it was an enlightening one. Jonathan Cowan, who co-founded the group with Kessler, attended the discussions, which at one point turned to the Republican right’s position on an matter of economic policy. None of the assembled experts, from a variety of fields, could find any underlying logic to their varying proposals. I suggested that the common thread was simply the economic self-interest of the politicians themselves, and of their financial backers. I was surprised when Cowan, who also seems like a pleasant person, grew visibly angry. He said it was “off-limits” to disparage the motives of your opponents and cut off my comments. I was struck enough by the tone of that remark to make a note of it afterwards. Anyone who studies economics knows that people often act in their own financial self-interest – sometimes consciously, sometimes concealing their underlying motivation even from themselves. Why the anger — because the subject hit too close to home? Because it undermines the defining principles of pseudo-centrism to recognize that many of our political debates are really a conflict between classe driven by wealthy people acting in self-interest? I don’t know. I tried to engage Cowan in a conversation about it afterwards but had no luck. The “Entitlements” line combines Medicare costs (and possibly those of Medicaid and CHIP as well) with Social Security. But Social Security is entirely self-funded, and is forbidden by law from contributing to the deficit. Its costs are not projected to skyrocket – but health-related costs are. Conflating the two comes right out of the broader, Wall Street-funded movement’s bag of tricks. Social Security’s funding programs are decades in the future. Medicare’s problems are steep and immediate. There are only two ways to address them: by slowly dismantling the program, or by comprehensively removing unrestrained greed from our health economy. Since their banker-backers are against the latter approach, they inevitably drive the discussion toward the former. Kessler and Third Way propose raising the retirement age for Social Security even more steeply than currently scheduled. During the radio debate Kessler argued that Social Security initially provided coverage for an average of 17 years or so, and that the qualifying age should be indexed as life expectancy increases. But that was never a an animating principle of this self-funded program, and it’s an inherently unjust idea. Remember, Social Security is a social insurance program. Insurance is designed to be there when you need it – not to be distributed according to abstract principles. Whether you have two car accidents or none, the principles behind auto insurance are upheld. The same should be true of social insurance. Here’s the inequity: Raising the retirement age affects all aging Americans immediately. But it’s primarily wealthier – and white – Americans who are seeing increases in life expentancy. Lower-income and minority Americans would feel the pain of a longer work life and reduced benefits, but would see much less of the benefits. This proposal could therefor be summarized as follows: As rich white people live longer, let’s keep cutting benefits for others who need them much more. The anti-social contract movement, speaking through Third Way, also proposes means-testing, a proposal we’ve debunked at length. Here’s the short version: If you think rich people are getting off too easy, raise their taxes. Funny, isn’t it? They never seem to mention that option. I worked in Eastern Europe and the former Soviet states during their conversion from Communism, as a consultant and project director on social insurance issues for the State Department. (“Bipartisanship” mavens take note: That was under Republican President George H. W. Bush.) For a brief moment the phrase “Third Way” gained some traction in European Communism’s twilight, as activists tried to galvanize support for a movement that was independent of both the capitalism of the West and the Communism of their past. They quickly discovered that the lure of MacDonald’s and Mercedes Benz was too much for them to fight. But that was a genuine “third way.”This “Third Way” isn’t “third” at all: it’s a repackaging of the same “One Way” that has dominated Washington for too long. It’s the same “One Way” that repealed Glass-Steagall, deregulated Wall Street, and brought down the economy. It’s the same “One Way” that has led to ever-increasing wealth inequity, growing poverty, and the decimation of the working class. It’s time for a real “third way,” one that’s based on a view of most Americans (including most Republicans and Tea Partiers). The real third way – the one that’s backed by voters, not highly-paid political elites – is a populist movement which believes that Social Security should not be cut, that Medicare should be protected, and that the rich should pay their fair share in taxes (without “simplification” gimmicks to confuse the public and cover their tracks). The faux “Third Way” crowd loves to claim that true progressives are living in the past, a 60’s-era universe of beads, Birkenstocks, and benefits for Medicare and Social Security. But they’re the ones living in the past. They’re stuck in the ephemeral economic illusion of the 1990s. They long to return to that bubble-fueled, illusory world where “centrist” Democratic consultants and politicians could savor both the admiration of liberals and the wealth of hedge fund managers. But that world is gone forever, while the progressive ideas they dismiss are supported by Americans across the political spectrum. Earth to banker-backed mock “centrists”: The dream is over. It’s time to really “break the silence” — by defending the public’s will and the public interest, and by defending Social Security and Medicare.